Square's upgrade links location and real-time, and a new survey finds mobile users are shy about buying. If you’re among those who downloaded Square’s Card Case digital wallet app back in May and haven’t opened it since, there’s something new in the latest upgrade that may inspire a return visit to the app: geofencing. 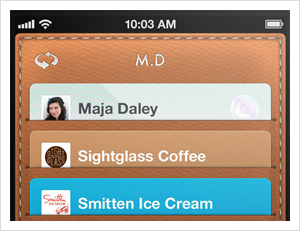 Card Case’s latest version takes advantage of new capabilities in iOS 5 to trigger alerts when a user enters a geofenced area. Users have to opt into the feature. Once they do, when they pass within 100 meters of a retailer who uses Square, the app will automatically load a card in Card Case. If you visit the shop and opt to buy something, you can complete the transaction by giving your name at the register and confirming the purchase through a text message that arrives on your mobile. First, for those of us who buy stuff — Card Case is an early form of the mobile wallet, one that isn’t waiting for phones or merchants to adopt NFC wireless. Unfortunately, few merchants use it. It’s no doubt more interesting downtown (isn’t everything?). But I live in a medium-sized suburb where most of the nearby Square-enabled merchants offer services I don’t use much: film editing, spa services, wine-country tours. It’s not going to be much help in keeping track of my expenses unless Square makes some deal with a larger network of merchants. Second, for those who sell things, the value is clearer — You can reach out and tap customers who may be close and ready to buy. As I noted this summer, Placecast is another player developing this service. Its ShopAlerts send out texts (for other merchants, not under its brand) when opted-in customers wander into a retailer’s geofenced area. Groupon Now has also entered this game, giving merchants the ability to manage offers in real time. Undoubtedly, Square will want to offer similar capabilities to its merchants so they can clear the shelves or fill the tables in real time. Location and time are far more predictive of intent than any other past behavior … We’re fast approaching a time where you’re going to be able to bid on a user on a street corner at a particular point in time in real time. The age of virtual barkers is upon us. Customers are becoming more comfortable sharing location data about themselves, but most still don’t trust mobile security enough to buy stuff on them. While tablet ownership remains fairly low, lots of people are planning to buy them and they want apps that work well on them. Shopping is obviously becoming more important, but for most the mobile shopping experience is still limited to pre-purchase research. Depending on the region, the survey found between a third and a quarter of survey respondents used their mobile phones for comparison shopping and reading customer reviews. But only one third believed their phone was secure enough to make a purchase on. In a related note, 84% bought their phone in a retail store, though most said they did their research online. The survey also found that smartphones are outpacing owners’ expectations of them. In 2010, 52% thought their mobile phone would replace their digital camera; this year, 43% said it already has. In 2010, 54% thought their mobile phone would replace their digital music player; this year, 34% said it already has. In 2010, 54% thought their mobile phone would replace their GPS; this year, 24% said it already has. Finally, the survey revealed rising enthusiasm for tablet usage. While only 16% said they have a tablet today, 41% plan to buy one over the next 12 months. Reading, watching television and movies, and banking ranked high on the list of things users wanted to use their tablets for, and in most cases they want these sorts of applications to work equally well on both tablets and their mobile phones. You can download the report’s executive summary here.